A “Fraction” means one piece of a whole. You can use fractions in any case where it might be useful to look at something in parts, rather than the whole thing at once. The most delicious fractions are slices of pizza. 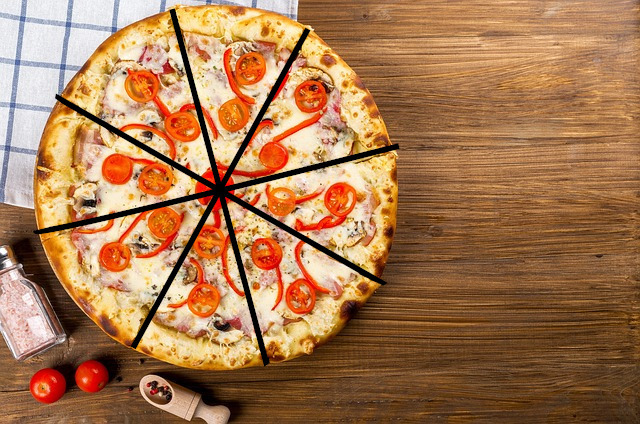 If the pizza is in 8 slices, we know that there are 8 parts. This means any time we’re talking about its parts, we know it is “__ out of 8”, or “__ / 8”. For the whole pizza, we have all 8 slices. 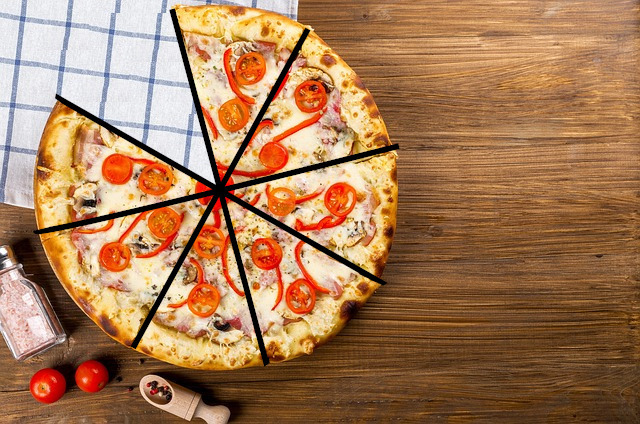 The bottom number in the fraction is the whole and the top number in the fraction is how much we have currently (in this case, seven slices of pizza). In this case we can’t divide the pie into equal pieces like we did with the pizza, since some stocks have a lot more than others. However, we can still show what “Fraction” of our portfolio is taken up by each stock. 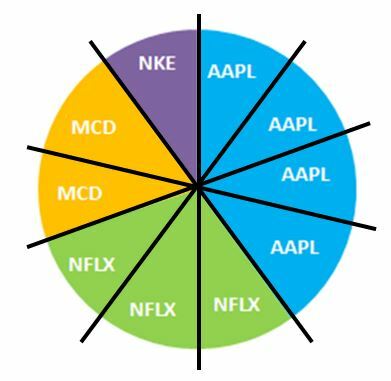 In this example, lets say our portfolio has NKE(Nike), MCD (Mcdonald’s), NFLX (Netflix), AAPL (Apple). Even though each stock is taking up different amounts of the whole, if we divide our portfolio in to equal parts, we can still get the fraction taken up by each stock. Just like before, the bottom number in the fraction is called the “Denominator” and is how many parts are in the whole. If we added all of of these fractions together we would get 10 / 10 which is equal to 1 (meaning the whole). If you do want to compare two fractions, one way is to multiply them so their denominators are the same. In this example, we can convert our fractions to both be showing their value out of 30 parts instead of 10 or 3. To do this, multiply both the numerator and denominator of each fraction until the denominator is the “Common” number. 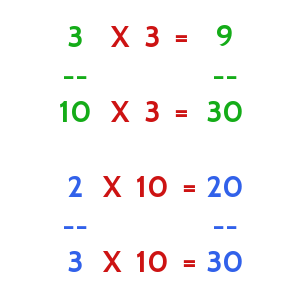 As long as you multiply the numerator and denominator by the same number, the fraction’s value will stay the same (“2 out of 3” is the same as “20 out of 30”). Now both of our denominators are 30, so we can compare them directly! Fractions are only used to look at parts of one thing, they are not used to compare different things. For example, we can use a fraction to show how much of our portfolio is made up of one stock, but we cannot use a portfolio to compare a company’s stock price to how much money it makes. Fractions work well when what we are looking at is always different parts of the same whole, but when we want to compare parts of different things, we need to use percentages. A percentage is a calculation that will tell you how big one thing is in relation to another thing. For example, you can use a percentage to tell how big your current portfolio value is compared to how much you started with. Percentages work like fractions, but the denominator is always 100, so you can always know which percentage is bigger or smaller. You can convert any fraction in to a percentage to compare them. This means when you see a percentage, the “%” sign means “Out of 100“. In the rankings page you will be able to see Gain / Loss (%). We call this your Portfolio Return. This is calculated by looking at the current value of your portfolio and compare it to your starting value and multiplying by 100. Or ((Current Value / Starting Value) – 1) * 100 . You have to do it in this order: (Current Value / Starting Value) then subtract 1 and then multiply by 100. Divide Current Value / Starting Value. This scales down both numbers so that “Starting Value” = 1. If your Current Value > Starting Value, the number you’ll get will be bigger than 1. If your Current Value < Starting Value, this number will be less than 1. Subtract 1 from the result. This means makes the “comparison number” 0 instead of 1. Multiply the result by 100. This makes your comparison 100 instead of 0. 0.0398543 X 100 = 3.98543% (we around the percentage to 2 decimal places, so it appears as 3.99%). Percent Return is very useful for comparing different stocks too. 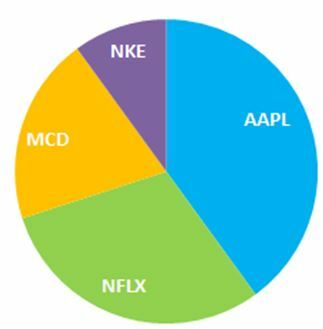 The NFLX stock (1.54%) has a higher percentage return than the AAPL stock (1.24%) even though the number of AAPL (11.85) is higher than (8.05). $11.85 is the amount of dollars you gained. The 1.24% is how much the stock price went up by. The percentage (bottom number) is much more important than the amount of dollars (top number), because it tells you how much the value changed compared to the price you bought it at. 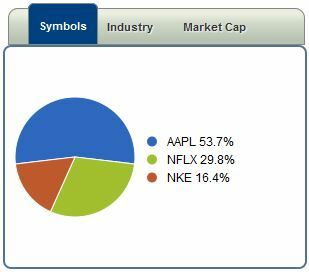 We bought 10 shares of AAPL (Apple), 5 shares of NKE (Nike) and 5 shares of NFLX (Netflix). Both the fractions and the percentages will always equal 100 / 100 or 100% because our pie is whole. Percentages are used normally to calculate the growth in something over time (like your portfolio return), or to compare parts of a whole when the denominators would be bigger than 10 (in our fraction conversion example, we can also say 2/3 = 66.6% and 2/10 = 20%). Ratios are a lot like fractions, but the biggest difference is that we only use ratios to compare different things. For example, if we want to compare the price of a company’s stock with how much money that company makes per share, we would use what is called the “Price – Earnings Ratio”. Since the “price of a stock” is not a part of “how much the company makes per share”, we would not be able to use a fraction. We would want to know the P/E ratio because that tells us how much the company is actually making compared to how much we’re paying for a share of it. When we read ratios, the “:” symbol means “to”, so we would say “100.15 to 9.21”. The P/E ratio gives an idea of how much investors are valuing the company’s current income – high P/E ratios mean investors expect the revenue to grow a lot in the future, low P/E ratios mean investors think the company will grow more slowly. By calculating the P/E ratio for different companies, you can compare the investor attitudes easily. 1 of 3) What does the "/" sign mean in a fraction? 2 of 3) Which of these is a good place to use a percentage? 3 of 3) How do you calculate a ratio?